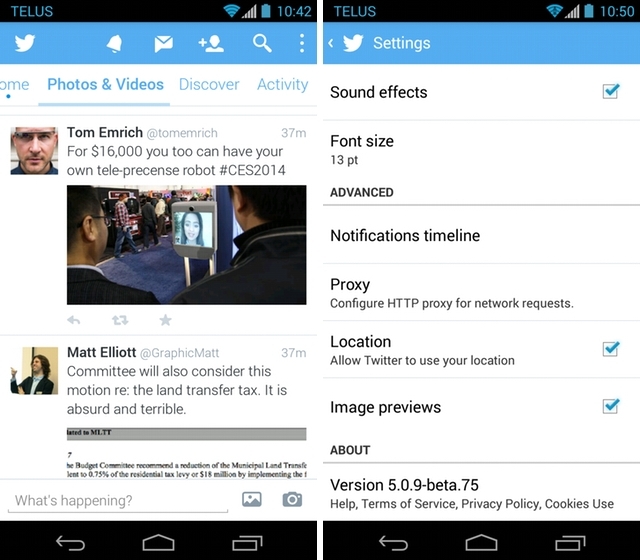 Update the Twitter for Android app in the company’s beta channel today and you may notice a new tab: Photos & Videos. The company often tests different features in its mobile apps, and the Android beta is usually the first recipient (for ease of distribution reasons, most likely). The tab, which fits in between Home and Discover, filters one’s feed to only display tweets with photos and videos attached, lending the timeline a much more media-focused tilt. While Tweetbot for iOS has had this feature for a while, its addition to the official Twitter apps has been a long time coming; the newly-public social network has been experimenting with ways to make the service more accessible to mainstream users, and focusing, like Facebook does, on big photos and instantly-gratifying, looping videos like Vine, does just that. It’s unlikely that the tab will stay separate for long — it will likely end up as an optional toggle for the Home timeline — but it mirrors Twitter’s recent strategy of encouraging users to post photos. Both the official Android and iOS apps were recently updated to quickly allow users to post a photo; the iPhone version even displays the last nine in your gallery by default. The filter is another way, too, of weeding out the noise from a busy timeline. Avid users who follow hundreds or thousands of people may occasionally want to find interesting news bulletins or cute dogs, types of content that become more prominent with photos attached. Also interesting is that Twitter no longer appends the hyperlink of the photo or Vine to a tweet in its mobile apps: the content is merely displayed underneath any text. We’ll see what happens with this addition — the Android beta channel has proven to be extremely volatile in the past, with the dev team nuking ideas before they’re fully formed — but this Photos & Videos tab is a good idea and I expect to use it a lot more than Discover or Activity.